Controversy has surrounded our national anthem a long time. But what, after all, exemplifies a good national anthem? "God Save The Queen" was the first, and ought to be a prototype, but it has less to do with England than celebrating monarchy. "La Marseillaise" is splendid, but really about revolution against monarchy. "O Canada"? As boring as gravy on french fries. In fact, bad examples far outnumber the good. A national anthem should refer to indigenous geographical and cultural qualities. It should be a unifying cultural artifact, recalling history, yet still looking to the future. Above all, it should be easy to sing. "The Star-Spangled Banner" is none of these. It is a dinosaur, awkwardly phrased, difficult to sing and a reminder of the only war where an enemy not only invaded our country but burned the Capitol. All glaring rockets and bursting bombs, the tune itself isn't even American -- it's English. The lyrics are really about war, the War of 1812. First published in 1814, as Frances Scott Key's poem "The Defense of Fort McHenry," its tone is confident, defiant, even imperial: "Then conquer we must, for our cause it is just," says the last verse. The tune to which Key set his lyric was a popular upper-class drinking song, "To Anacreon In Heav'n" -- the theme of The Anacreontic Society of 18th Century London. And it actually does make a quite jovial drinking song, with a dramatic caesura followed by the tipsy high tenor note on the last phrase. It is an uncomfortable participational experience for the same reasons: Try hitting that note sober. Most people don't bother when they sing it, and ballparks around America grow strangely silent for a beat or two. the original song has Anacreon, a 5th Century B.C. Athenian poet, calling down in an effete falsetto, from his perch among the immortals. I'll lend ye my name, and inspire ye, t'boot! Made the official national anthem in 1931 by an act of Congress, "The Star-Spangled Banner"'s militancy served honorable goals in times of national crisis. But does it really express who we are? Shouldn't a national anthem speak to noble ambitions and worthy goals? And if this doesn't, what does? Hail, ye heroes! heav'n-born band! That vision of the newly independent states as a "band of brothers," rather than a single "nation," would not be settled until the Civil War. Indeed, the Confederacy's own national song, "The Bonnie Blue Flag," quotes from it: "We are a band of brothers, and native to the soil." With its vision of peace and safety, "Hail! Columbia" was too benign to survive the fratricidal ferocity of that war. "The Star-Spangled Banner" marched in to take its place. 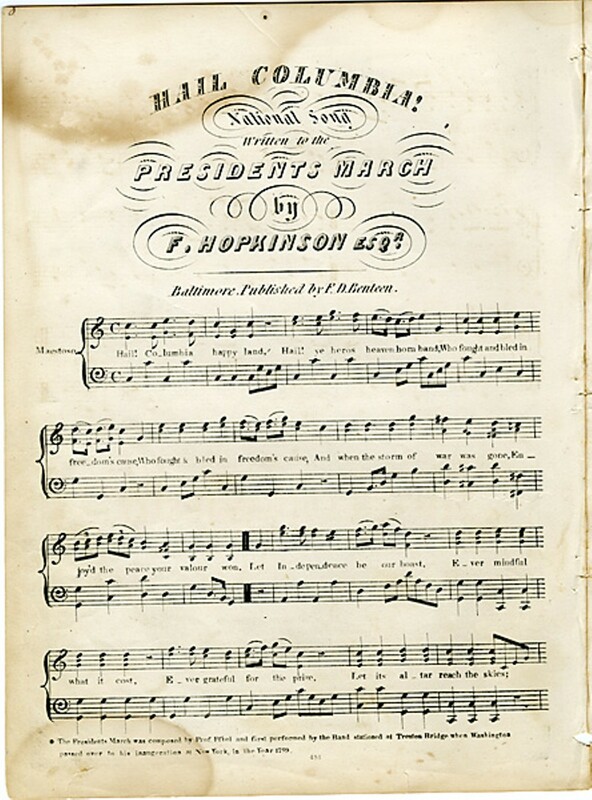 Dr. Mason, had he proceeded with more scholarship and less cupidity, might have discovered that the tune was already in use, as "God Save The Queen." 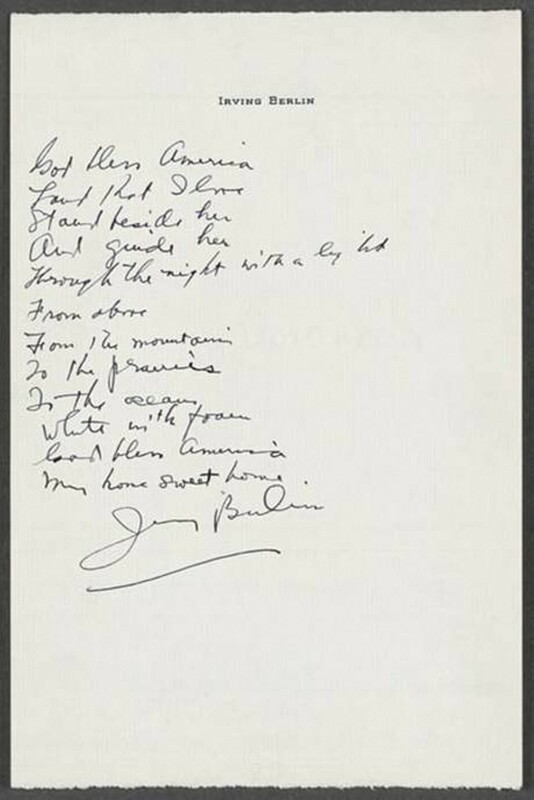 Nevertheless, that plodding lyric would hang on for a century, droned by schoolchildren, probably because it was one hell of a lot easier to sing than the alternative. By the Spanish-American War of 1898 (in which the U.S. acquired Cuba, Guam, Puerto Rico, and The Philippines), patriotic fever was at a high. 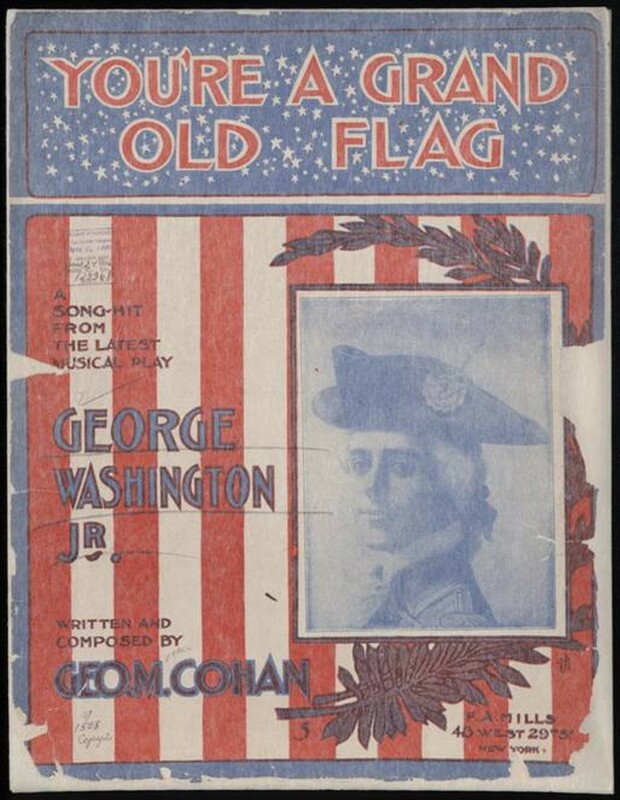 The precocious young vaudevillian George M. Cohan wrote, directed, and starred in the 1906 hit musical "George Washington, Jr." In this play, he adopted a sketch with which he would be identified for life. He would march up and down the stage carrying the American flag while singing patriotic songs. Among his best was "You're A Grand Old Flag"
And forever, in peace, may you wave! There is a lovable naiveté about this march-song, with its singular message: a "Star-Spangled Banner" for the American Century, and a World's Fair tone of exultation. Cohan had defined in himself the national song, and pretty well cornered the market over the first two decades, with jaunty tunes like "The Yankee Doodle Boy," "I Want To Hear A Yankee Tune," "Give My Regards To Broadway" and "Over There," songs that captured the ear of America -- tuneful, simple, and memorable. It is, ironically, their very trueness to the vernacular of American English that disqualifies these for anthem-hood, which requires a certain loftiness of spirit. In 1918, Irving Berlin, then known as the "king of ragtime," was in an army unit producing an upbeat musical comedy about ... an army unit. An early draft of "God Bless America" was dropped from the show as too pretentious and solemn. 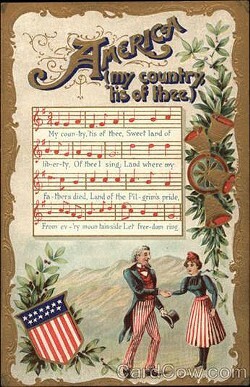 Two decades later, he revived the song, which premiered on Kate Smith's radio program for Armistice Day. The shadow of World War II was looming, and Berlin, with his uncanny finger on the pulse of the nation, wanted a song to unite a country still reeling from the Great Depression. If we were looking for something that fit "Tea Party" sentiments, "God Bless America" would be it, with its invocation of God's uncritical blessing, its list of national resources to be exploited and its unthinking patriotism. The march-like rhythm, the highly memorable and singable tune, and straightforward sentiments, are all in its favor. 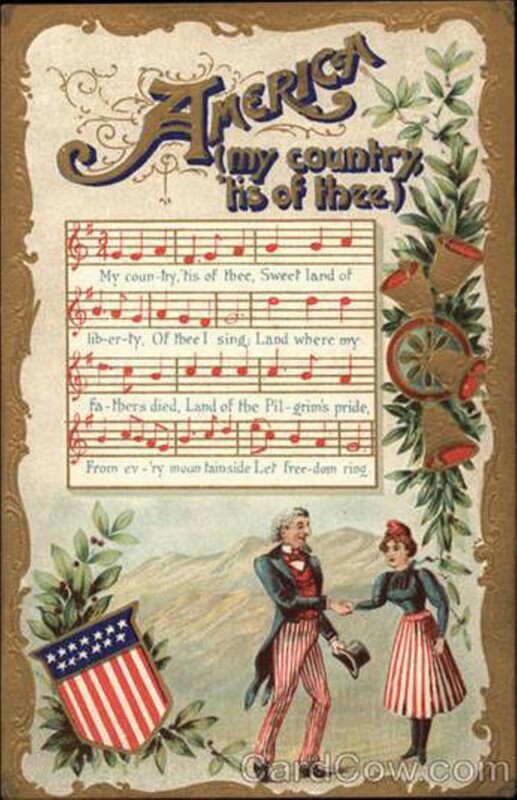 It's considered the most popular of the candidates to replace "The Star-Spangled Banner as well." But again, the song is inextricably linked with the war that followed, and tied into the patriotic fervor of its times, a fervor that exhorts God, rather than celebrates national spirit. Alas, these have been excised over time, the song diluted to the point that it's taught in public schools as a "folksong." Even so, the rural tone and folksy lyric make it a long-shot for anthemhood. reflects a culture in which patriotic ideals no longer inspire us, and rock-bottom is the only country we know. Where does that leave us? Mindless patriotism has served us ill, social progress divides us -- yet we need a national anthem that praises what is great, one that rejoices in our blessings, but also which exhorts us to persevere -- to continue the struggle to become what we have not yet attained. Tuneful, easy to sing and everyone knows it. And isn't that closer to who we want to be? From Atlantic to Pacific, a nation founded upon principles, not of what we have been, but of what we can become. With an anthem that celebrates not military victories of the past, but the rich potential of the present, and asks divine guidance for moral and social battles yet to come.